So Doctor Who returns for the second half of the latest season. I don't like this as it splits it all up and rather than being something to look forward to, which then runs for 14 or 20 weeks or whatever, Who becomes a blink and you miss it event ... but oh well. 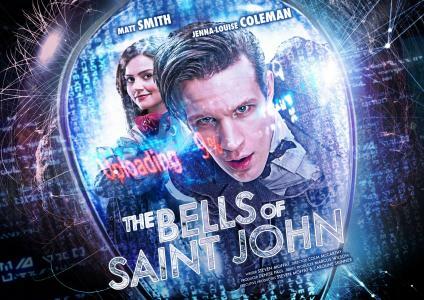 'The Bells of St John'. Never was a story more misnamed. I suspect that they didn't know what to call it - 'The Return of the Intelligence', 'Connection Problems', 'The Curse of the Wi-Fi' ... those make sense, but the title they used refers to the TARDIS phone ringing when Clara calls and that's it - actually nothing to do with the actual story at all. And the story ... well it's a light mishmash of everything that Steven Moffat has done before really. There's something real-world which goes scary (children, clockwork toys, statues, the dark ... and now Wi-Fi); a catch-phrase ('Are you my mummy? ', 'Don't Blink! ', 'Who put out the lights?' and now 'I don't know where I am! '); timey-wimey stuff; a manic Doctor; and a character who speaks so hip and knowing and arch that she comes over as being 'written' and 'developed' rather than natural. So the Doc is in 1207 living as a monk whilst pondering the enigma which is Clara Oswold. Never mind why, he just is, okay! And then Clara calls him (or rather *a* Clara calls him - as we know, there are lots of them about) and wants to know why she can't get on the internet. She got the number from a woman in the shop ... so ... River Song? Clara is just plain daft ... doesn't everyone understand that you don't phone a help desk for something like that? Or maybe that's the point, she's meant to be daft (at least before the internetz are downloaded into her head ... or something ... but anyway, that's for later). But it's very 'written' and this is the main problem I have with her character. She's just not remotely believable! So the Doctor dashes in his TARDIS over to her gaffe to see her, but she's a bit bemused at this mad Monk arriving that she ignores him. But, having clicked on the Wi-Fi thingy, she's then confronted by a girl from a book written by Amelia Williams (aka Amy Pond, aka something the BBC can then make money selling) who uploads her into the internetz run by that woman off of Acorn Antiques. We get a sort of lo-fi re-run of 'The Idiot's Lantern' with people trapped in telly screens for a while, but the Doctor changes his outfit and rescues her by making the 'spoonhead' put her mind back in her body (as the upload wasn't complete - sounds like the dial up like speeds we have here at the moment to me!). Anyway, in a nifty bit of wassname, the Doctor takes the TARDIS onto the plane and saves the day and the passengers, before heading for London to try and track down these Wi-Fi controlling people. While Clara uses her new computer skills to hack their systems and identify them all from Facebook, and to find out where they are, Kislet shows off to the Doctor by talking to him via random people in the café (a nice, creepy sequence really) while another 'Base Station' spoonhead looking like the Doctor re-uploads Clara. 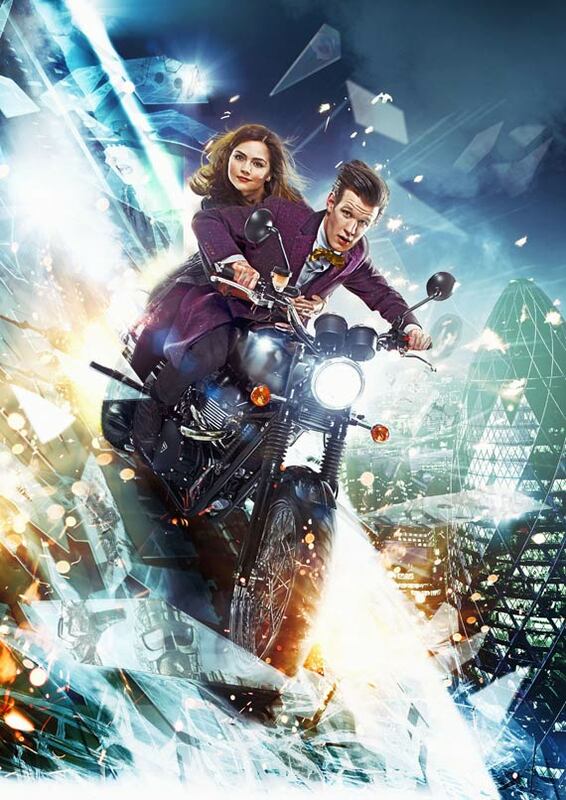 The Doc gets angry and rides his motorbike up the outside of the Shard, crashing into Kislet's office. But it's not the Doctor ... it's the Spoonhead (how did he get it to do all that then! ), and it captures Kislet ... the Doc then makes her minions release everyone who has been trapped (despite the fact that they need a Spoonhead to replace them in their bodies as previously established!) So loads of these people are presumably now just dead. But in a dramatic twist, the Client is revealed to be Richard E Grant - it's the Great Intelligence again from the last episode ... this time capturing human minds and keeping them in the internetz ... which is sort of the plot of the Doctor Who spin-off film Downtime from the mid-90s, where the Great Intelligence enslaves humans and uses the Internet to try and take over the world ... Except that Downtime has Yetis and bleeping spheres and all the 'right' trappings, whereas 'The Bells of St John' has nothing except a 10 second cameo and lots of hot air. The Intelligence releases Miss Kislet who reverts to acting like a little girl (not sure why) and the Doctor and Clara are saved. Hoorah! Of course the Doc has to ask Clara to travel with him, and while she doesn't agree, she tells him to ask her again tomorrow ... she might say 'yes' then ... and it's all over for another week. It's all very fast and furious and there are some lovely set pieces. I loved the TARDIS interior again - easily the best the series has ever had, and I liked the plane crash scenario, the café sequence, the riding the bike up the shard ... so many good bits ... but all held together by smoke and mirrors. There's no plot here. It makes no sense. There's no character development for anyone - all are just ciphers - and the Great Intelligence seems to be there for no discernible reason. You just have to watch, disengage brain, and go for the ride. Back in 1967 it took the Doctor, Jamie and Victoria six weeks of tense action and drama to uncover the mystery of who the Intelligence was, what it wanted, who were its pawns, and why the Yeti were roaming the mountains of Tibet ... That's why there was another 6 part sequel set in the London Underground the following year, and why, some 45 years later, we still remember the episodes and the monsters ... here we get 45 minutes of flash bang wallop which is forgotten 10 minutes into the next programme. Maybe that's all that Who can aspire to be these days, a flash in the pan ... which is the biggest mistake and the biggest tragedy of all. Yes, it was an odd way to open the second chunk of this season. My reaction was " ....meh!" A weak story crammed with action but no internal logic or real plot. I think Smith is great actor but I've only really enjoyed his portrayal of the Doctor in his first season, I think the 11th Doctor is pretty unlikable: all self-important speeches, exposition & bad comedy pratfalling. For all the excesses of RTD's era he was a showman. Moff's era is rather drab & continually boring "writerly" touches to convince us that we're watching a "Great Intelligence" at work, more of a "Big Head" than a Yeti .I think the sad thing is outside the group-hug that is DWM's reviews fandom looks distinctly underwhelmed by modern "Who." I hope we seem more charm & actual human drama & adventure in the rest of 2013. I thought it was OK, although certainly no classic.